It’s a hot day at Camp David in Mammoth, and teenagers are absorbed in an invigorating soccer game. As the sun beats down, the boys peel off their shirts and continue tearing around. All have the same energy and determination for their team to score a goal, but half are distinguished by the plastic catheters taped to their bellies. Diagnosed with severe kidney failure, they require daily treatments to stay alive and active. The National Kidney Foundation has sponsored them for a week at the YMCA-run camp. There they have the chance to hike, swim, learn archery and go boating with peers. What’s more, camp gives these young patients the chance to practice caring for themselves under the supervision of a dedicated medical staff. For children who hope to join the waiting list for kidney transplants, these skills are crucial. Transplant candidates must adhere to a rigorous program of medications, physician’s visits and strict diets. The treatment mainstay is dialysis, the use of various mechanical techniques to stand in for the kidney’s life-sustaining function of filtering toxins and waste from the blood stream. Depending on the type of dialysis needed, treatments take place either several times a day or several days a week. In either case, the process requires several hours to complete. For patients with kidney disease, there is no such thing as a carefree, relaxed schedule — life must be planned around dialysis treatments. Young children can rely on their parents to coordinate and oversee their intensive treatments. But as kids reach adolescence, they need to learn to take care of themselves, says Isidro Salusky, director of UCLA’s Pediatric Dialysis Program and a long-time camp physician. 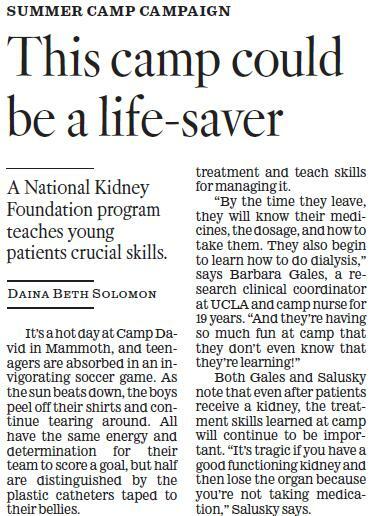 According to Salusky, the Kidney Foundation team takes every opportunity during the one-week camp session to emphasize the importance of complying with treatment and teach skills for managing it. Both Gales and Salusky note that even after patients receive a kidney, the treatment skills learned at camp will continue to be important. “It’s tragic if you have a good functioning kidney and then lose the organ because you’re not taking medication,” Salusky says. With $1.6 million raised last year by the Los Angeles Times Summer Camp Campaign approximately 6,500 children will go to camp in Southern California this summer. The Summer Camp Campaign is part of the Los Angeles Times Family Fund, a McCormick Foundation fund, which matches all donations at 50 cents on the dollar. Donations are tax-deductible as permitted by law. Addresses will not be released or published. Mail donations using the attached form (do not send cash), donate by phone at (800) 518-3975 or donate online now at latimes.com/donate. Tags: LA Times, summer camp campaign. Bookmark the permalink.